Artist's Comments: The second of two commissioned paintings was a wonderful treat to create. 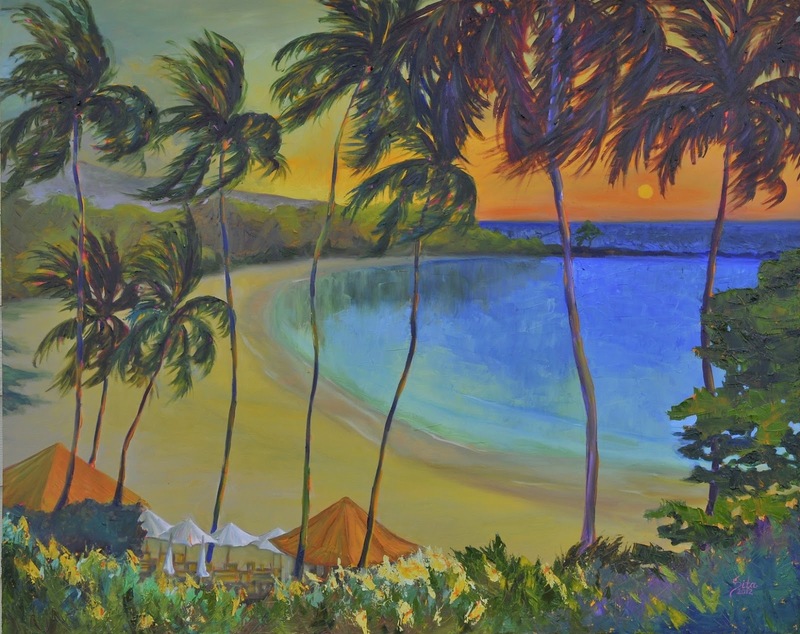 The first painting "House on the Hill" featured the shoreline, hotel and slopes of Hualalai mountain. For the second piece, the collectors wanted to capture another view of the beautiful bay and provided me with a photo that they captured from the hotel itself looking down on the beach. The picture was taken during the day and they asked if I could create a sunset scene for them. Sunsets are quickly becoming one of my favorite subjects to paint. 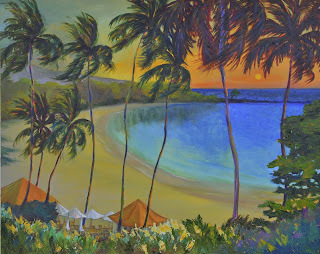 I started by reviewing countless photos and in-person viewings of Hawaii's sunsets (the field work required by this painting was just treacherous!). Since the color scheme of the decor is orange and turquoise, I was particularly interested in a golden sunset that faded into subdued aqua tones. 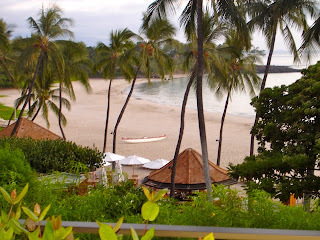 One day while enjoying an afternoon cocktail under the shade of a friend's lanai, we witnessed a wonderful sunset. The sun was just above the horizon and took on a wonderful orange, yellow, white shade that was so luminous yet, not too bright for our gaze. At this moment, I looked around and noticed that at this time of day, the surrounding landscape took on a wonderful glow. All the colors were visible but seemed to be kissed with a tinge of gold. That was my inspiration and I did my best at recreating this luminous ball of fire as it made its journey to the other side of the world. The collectors wanted me to create this piece with some realism but mixed with an impressionistic feel. I decided to render the palm trees and structures with more careful detail. For the ocean and foreground foliage I decided to use a palette knife to create an impressionistic feel and to bring in texture to the painting. I painted these areas with subdued tones so that your eye is drawn into the bright sea and setting sun.